At the recent American Association for the Advancement of Science (AAAS) annual conference in Boston, thousands got the opportunity to see a demonstration of some of our latest tools and some new interactive exercises to help people understand climate change. The exhibit was put together and led by University of Massachusetts Lowell professor Juliette Rooney-Varga and her students as part of the UMass Lowell Climate Change Initiative to showcase how engaging learning about climate change can be. Below the UMass Lowell news office recounts their experience showing off these tools. 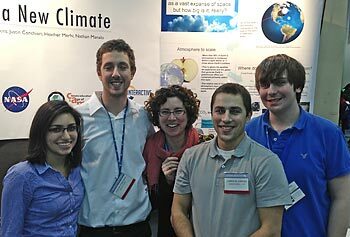 Students experienced firsthand the important task of communicating climate change to the general public during the “Family Science Days” event held at the American Association for the Advancement of Science (AAAS) annual meeting in Boston in February. Joining Conchieri were fellow biology seniors Cameron Jenkins, Heather Merhi, Nathan Manalo, Chika Iloh and Itoro Inoyo and biology sophomore Jared Nease. The students created an exhibit entitled “Games for a New Climate,” which was packed with interactive sessions that engaged children and parents alike. “The activities combined simple, hands-on demonstrations with state-of-the-art decision-support computer simulations developed by one of our collaborators, Climate Interactive. The simulations are used by the U.S. Government, the United Nations and others,” said Rooney-Varga. CO2 backpacks. Students brought five backpacks loaded with 1, 3, 5, 25 and 105 pounds of weight, and people had to guess which one was equivalent in mass to the average American’s daily carbon dioxide emission. “Kids had fun trying to pick them all up, while parents looked shocked when they found out that it was 105 pounds,” noted Rooney-Varga. Carbon Trust Fund. Using Hershey’s Kisses as “money,” the demonstration taught participants that they could actually make a profit by reducing the amount of carbon dioxide they emit. Energy-policy game. In this exercise, people were asked to fill out energy policy choices, which were then entered into a powerful simulation tool called En-ROADS to find out if they were able to meet their emission-reduction goals.